Over the past 24 years we have completed a wide range of simple to extremely complicated projects. 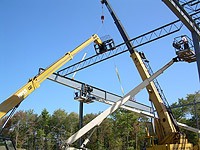 We are experts in planning and executing all phases of metal building construction, and we consider our specialty to be difficult and high profile projects. We regularly install metal roof and wall systems, insulation systems, and solar panels, and are experienced in various green building technologies. The nature of our business dictates that we complete every aspect of each project with great forethought and planning. We strive each and every day to exceed this goal. We are members in good standing of the Metal Building Contractors and Erectors Association (MBCEA) and are an authorized Chief Buildings dealer. MMS Northeast, Inc. employs ten experienced and specialized men whose tenures average 8 years with our company. Our most recent employee joined our company over 3 years ago. We take pride in the retention of our employees, which we believe is a result of fair treatment, training, respect, good wages, and pride in the work we complete for our clients. To learn more, read our President's letter. Our workers are fully trained and licensed to operate all company owned equipment, including material handlers, forklifts, scissor lifts, and boom lifts. We attend many safety seminars and training on topics such as rigging, hoisting, modular erection, equipment safety, and OSHA compliance. Each project has a job specific Safety Plan developed prior to start up, and weekly project safety meetings are conducted with all employees. Training and safety are key daily components of all our operations. "Over the past few years MMS Northeast has completed 3 substantial metal building projects for 'high profile' clients insured by Factory Mutual Insurance Company. Your attention to detail and understanding of Factory Mutual requirements has allowed your firm to complete all three projects on time while meeting FM Global requirements for pre-engineered metal buildings." Copyright ©2019 by MMS Northeast, Inc. All rights reserved.